Rescued from the outrageous neglect of his aunt and uncle, a young boy with a great destiny proves his worth while attending Hogwarts School of Witchcraft and Wizardry. Contains book and series spoilers. Part of the Harry Potter Club reread/rewatch events. Next month is the Chamber of Secrets. For those of you in the UK, I would absolutely recommend touring the Warner Bros' studios, it's pretty impressive. There's no doubt that in many ways this film was a success at putting the book on screen. The world is incredibly well realised, and the actors are really well cast. Yes, none of the children are terribly good actors, although part of me gets a thrill out of quite how pedantically Emma Watson reads her lines. Rupet Grinch will be counted on to provide grimaces and little else. His marginalisation begins early. As I mentioned in the books thread, every significant thing Ron does is taken away from him. -In the final sequence, it's Ron who reminds Hermione she can do magic (! ), but in the film Hermione solves everything. To be honest, part of me doesn't mind Hermione being more awesome, but she's pretty great to begin with. In general I have a problem whenever the films make changes that don't seem to serve any purpose, and my knowledge of the books hurts my enjoyment of the films because of that. I don't think it's unfair to suggest that Columbus' choices are fairly pedestrian here, and I think the changes made are mostly negative. The quidditch match between Griffyndor and Slytherin, for instance, turns it into a wacky races thing where Slytherin cheat outrageously but unlike the books Hooch doesn't even seem to notice. Finally the whole "I can show your parents" thing Voldemort does in the final scene is pretty goofy; the idea that Harry would be tempted to evil is just patently absurd. I mean, would anyone be tempted to evil by a face on the back of someone's head? According to imdb they actually filmed a scene where they said sorcerers stone rather than philosopher? Does that mean everyone in the US was forced to film the stupid version? I don't see how changing it to sorcerer's stone makes it the "stupid version." Book and movie titles are changed for different markets all the time. Does not teaching 10 year old kids about the philosopher's stone in school make them or the system stupid? On the other hand, most 10 year olds can infer that "sorcerer's stone" involves magic. The acting in the first movie is not altogether terrible. There are certainly flashes of brilliance, and plenty of scenes that are cringe worthy. But for a cast of 11-12 year olds it exceeds my expectations. And nearly every main cast member very quickly grows into a good actor. By the second movie I completely stop thinking about the acting and get absorbed into the fun. That said, Hermione in this movie is so deliberately pretentious it's almost adorable. I've always thought Harry Potter himself to be an awful wizard. Sure, he is good at one or two spells, namely Patronus and Expelliarmus. But nearly every good thing he does is through sheer luck/destiny or because he has friends with him who are much better at wizardry. This is partially intentional, as he's playing the role of an audience surrogate. 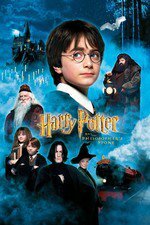 Yet I was watching this over the weekend with the concept in mind that Harry Potter is an Unreliable Narrator, and trying to fit the two ideas together. Why wouldn't Harry build himself up to be this incredibly powerful wizard? Self loathing? Potential drinking game: take a shot every time a character pulls out their wand but forgets to use it. Alternate potential drinking game: take a shot every time a student is put in danger through sheer neglect on part of the school staff. I remember thinking when I first saw this movie how incredibly well it was cast — nearly everyone was exactly as I had pictured them from reading the book. With the possible exception of McGonagall; from the books I had pictured her as younger, maybe in her mid-40s. This is not to take anything away from the wonderful Maggie Smith, and of course now it's impossible for me to see McGonagall as anyone other than Smith. I missed this, too, as it's one of my favorite lines in the book. "ARE YOU A WITCH OR NOT?" I was also struck by weird small changes that seemed to be made for no good reason. Why was the snake in the beginning from Burma instead of Brazil? Not that it's important, but it seems like a small thing for a screenwriter or director to even bother with changing. The dangers associated with Hogwarts really seem more obviously ridiculous in the movie than the book, i.e. when Dumbledore finds Harry sitting in front of the Mirror of Erised and says something about how many wizards have gone mad from what the mirror has shown them. Naturally that's the kind of item you want to leave sitting alone in an empty room in a children's school, then. I feel like the schooling parts of the story are a bit thin in this movie as well. They're only shown in class a handful of times and never actually learning anything! I get that it's trying to set up an entire world, but learning magic is the fundamental reason they're there and we never are really given any information on what that's like, except for Wingardium Leviosa. Oh, one change I did like was getting rid of that whole implausible storyline about Harry and Hermione for some reason becoming responsible for figuring out how to get rid of Hagrid's dragon. It's a lot simpler and made just as much sense that they'd get detention for wandering around on the dragon-discovering trip. I don't see how changing it to sorcerer's stone makes it the "stupid version." By stupid I mean I think the change is stupid, not that the audience or film is inherently stupid, if that makes sense. I don't think eleven year olds in the UK generally know what a Philosopher's stone is either, but Hermione is there to politely explain it to us, and her "don't you read" statement seems a bit more sane when she is referring to something with a bit more specificity than a sorcerer's stone. Much like I cannot recall the lyrics to any of the songs from The Rocky Horror Picture Show without the audience callbacks included, I cannot remember anything from Harry Potter and the Sorcerer's Stone without Brad Neely's Wizard People, Dear Reader voice-over. My impression on first reading the books was that given his upbringing utterly outside the wizarding world -- i.e. with no knowledge of it -- he was always going to be behind the others or surviving on his innate abilities until he had a chance to catch up. Yeah, Parasite Unseen, to me this movie is not one that I can actually watch on its own anymore. It's just the substrate that enabled one of my very favorite movies of all time, Wizard People, Dear Reader, to be made. I think I've seen Sorcerer's Stone maybe three times total, but I've watched WPDR dozens of times, listened to it in the car as a standalone audiobook, and still, in the present day, quote it all the time. Good God man, are you trying to KILL me? It's also a bit unfair that he was paired with a guy who grew up in a wizard family, and an utter genius. Yeah, he is going to look weak in magic. He'll, her didn't even get the textbook until the day before going to Hogwarts. Here's an interesting facet to the mudblood divide, that the books missed. A lot of mudbloods would be playing catch-up, so it would be ready for the bigots to claim they're naturally interior at magic. I will forever love this movie for Oliver Wood explaining Quidditch. Considering the DA and what we know of Harry's OWL marks, he seems to be a good if not spectacular wizard with a couple of areas of strong aptitude -- like most good students in real life. He comes off worse than he is because so many of his family, friends and allies are experts in their domains or out-and-out geniuses, frequently both; plus he's always pitted against opponents superior to him in knowledge, even in the Triwizard Tournament. But even then most of his academic failings have as much or more to do with poor teaching than him. I think there's a bit of a "nerd factor" at play where being into Potter fandom enough to participate in online discussions preselects for people who worked hard in school and don't get why Harry doesn't. I know when I was a kid I didn't get why Harry was so willing to coast unless pushed; as an adult I can see how the actions of the Dursleys, Voldemort, Dumbledore, etc., would encourage Harry towards fatalism and a distrust of structured authority which would not be conducive to giving a crap about school. But even without trying that hard he does okay for himself. Also this movie is terrible, but Emma Watson's line delivery of, "We could get killed -- or worse, expelled!" is perfect. I will forever love this movie for Oliver Wood explaining Quidditch . I will forever love this movie for Oliver Wood. Be still my swooning, 18-year-old heart. I try as a rule not to make fun of people's names but I still can't get over the character named Oliver Wood being played by an actor named Sean Biggerstaff. Think of Harry Potter as an athlete with an enormous amount of innate talent. He can just do stuff, but he doesn't really understand how. And how many friends does Voldemort have? Friendship is magic. Have you people learned nothing?